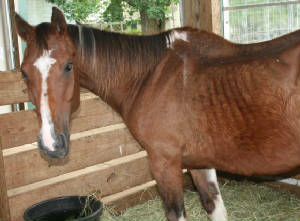 Rescued May 17, 2011 Danielle was desperate to help a Paint horse's new owner find a new home for his horse. He had taken the horse in an attempt to rescue it from starvation six month previously, however, he knew very little about carrying for horses and nothing about rehabilitating starved horses. 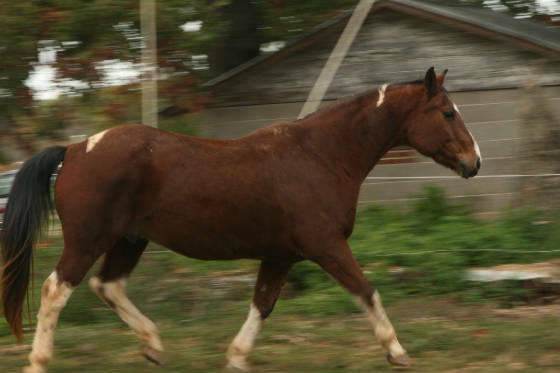 We see this very often as well meaning individuals try to rescue horses on their own and often the horse bounces from home to home until it ends up in the hands of Animal Control or dies. 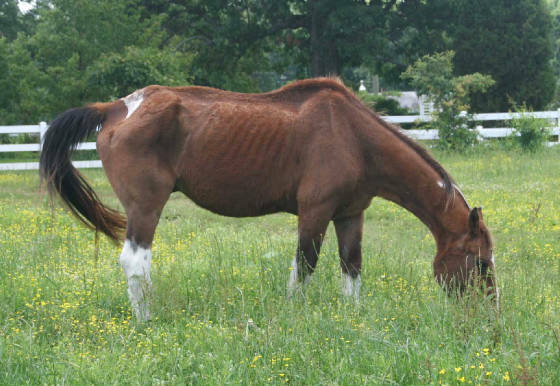 Danielle contacted her local animal control and they told her that they would have to euthanize the severely emaciated horse if they took him in. 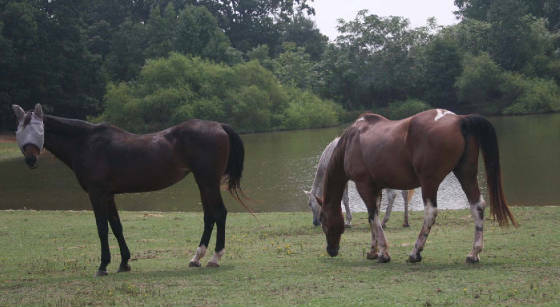 Horses in this condition are extremely expensive to bring back to health and they require round the clock care. Hearing this, Danielle sent HPS a photo of the poor starving horse and an email informing as much as she could about his condition.. 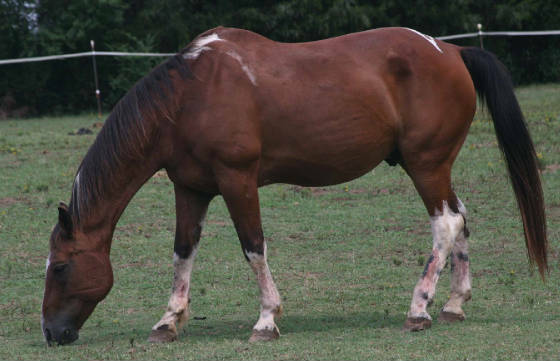 Rated a "1" on the Henneke Scale, we knew that the horse did not have much longer to live. The horse was 180 miles from the sanctuary. We would arrange the transportation but Danielle would have to have the owner sign the horse over so we could pick him up. Our heroine had not expected to get this involved in the rescue. It was so far out of her comfort zone but she would go and speak to the owner and try. As you can see, Danielle succeeded in her mission and Dale Palmer transported the gelding to the HPS sanctuary in China Grove one cold rainy morning. Commodore spent his first few days at the sanctuary in one of our medical stalls where we could keep him warm and dry until we were certain he would be strong enough to get himself back to his feet again if he layed down. When Commodore arrived at the sanctuary he was so unsteady that he had to plant his rear legs wide apart to maintain his balance. He could not lift his feet for the farrier or the chiropractor. Our vet thought that he may have a neurological condition such as EPM. Time will tell. The equine dentist placed his age at about 21 years old. 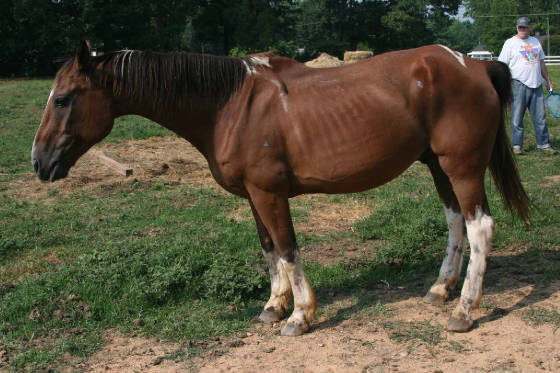 We marvel at the wonderful bone structure this sweet gelding has. He reminds Joanie of the horses she saw when she lived out west in Colorado. It would be nice to know more about who he is. Commodore, as he is now known, also has a Roman nose which we haven't seen very often in Paint horses. Commodore has gained his weight back but has always shown neurolgical problems. The farrier finds it extremely difficult to trim Commodore's rear hooves. HPS tested him for EPM twice, treated him for allergic encephalitis which mimics EPM, changed his diet, had him treated by a chiropractor and had him evaluated by a veterinarian. Eventually, we trailered him to Davie County Large Animal clinic where he was x-rayed by Dr Meeker. Digital radiographs showed compressed vertebrae in his neck at C3 & C4 just below a divot in his neck. It appears that at some point in his life Commodore had an accident while he was tied causing irreparable damage to his spine. Horses should NEVER be tied for this very reason. Because Commodore's condition has been stable for the time that he's been at the sanctuary and has exhibited no sign of being in pain, Dr Meeker felt that Commodore could live a long and happy life. HPS will allow Commodore to live out the rest of his life at the HPS sanctuary. Click here for Angel Sponsor form! 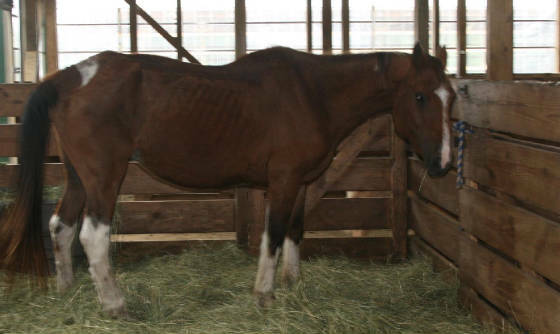 Scroll down to see photos of Commodore's amazing transformation as he recovers from starvation. Commodore on arrival May 17th. Commodore after a few days of care on May 20th. 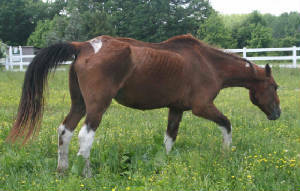 Commodore in the side field recovering in July 2011. Commodore in August 2011 with the main herd. With friends Breeze & Prairie Flower in August 2011.